As providers of a service, part of our jobs as PR people is demonstrating our competency to the people who pay us for our expertise. An essential ingredient in that demonstration the simple act of carefully listening to the people who come to us for help, so we can sift through what they are saying, find their concerns, and distill a plan to realize their goals. But it all starts with listening. I was reminded of this “if you only do one thing” rule just this week, when a professional team to whom I went for their expertise did something that made me question their competency. It wasn’t a huge problem, and what I was mostly looking for was their recognition that they had made a mistake and suggest a quick fix, so we could move on to re-attack the larger reason I had hired them. But when I inquired as to the breakdown – I wanted them to be successful on my behalf, obviously – they first blamed everyone else who had a hand in the process. When I rejected their passing the buck, they proceeded to tell me why I was wrong to blame them – because I wasn’t in their business – and barely took a breath while doing it. I couldn’t even respond to the thousands of syllables flying across the phone line. They finally accused me of not showing them any respect. And that’s where it – and I – got a little ugly. But let’s leave that story for another day. It’s easy to strut in front of a client – whether you drop influencer names, use insider lingo and spin yarns to prove how awesome you are – in an attempt to demonstrate your skill at your profession. But it almost always comes across as either arrogant, insulting, annoying or (usually) all three. Point is, you can’t begin to diagnose a problem without listening first. After hearing what your client wants to tell you, it’s your turn to ask questions and probe deeper. Uncover everything they might be thinking and feeling. Only then can you offer an opinion. If they disagree, or think you’re wrong, you can discuss it. If they’re being unreasonable or unrealistic, there’s a gentle way to tell them that, but always with their goals in mind. It’s a strategy that will end well for everyone involved, and ultimately get you more business. 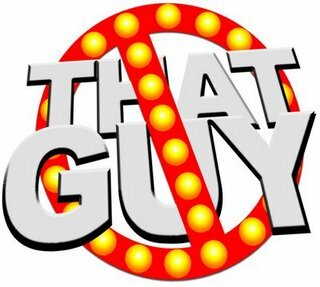 BONUS: This is a funny interactive website that tests your knowledge of whether you are “That Guy.” (OK, it’s mostly about beer.) Have fun! DOUBLE BONUS: Here’s a great video of Chris Brogan explaining what “THAT GUY” is in the social media world. Make sure to follow Chris on twitter, too.